The 700 Series True Marine Entertainment System is the culmination of FUSION's engineering and design brilliance, resulting in a product with superior sound quality, controls and features never seen before. The MS-IP700i represents the perfect mix of innovation, functionality and ease of use, driven by feedback from the marketplace direct to your vessel. Nominated for a DAME design award for marine innovation, and winner of the 2012 NMEA Supreme Technology Award - the 700 Series is not just a step ahead - it's light years ahead. 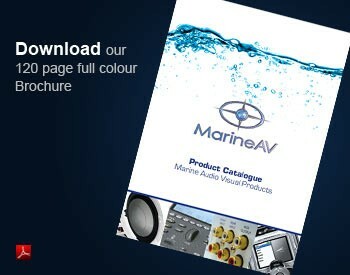 Bluetooth Audio Streaming - Add the MS-BT200 or MS-BT100 to your FUSION 700 Series marine entertainment system to enjoy your favourite audio tracks within range, around your vessel. Improved Connectivity - The MS-IP700i features an external USB connector for improved media device compatibility. An improved marine grade FUSION remote control network connector for added reliability and simplicity. FUSION-Link - Certified marine Multi-Function Displays (MFD) become the entertainment control centre for the entire vessel once connected to the MS-IP700i Marine Entertainment System via a NMEA 2000 or Ethernet connection. Control settings, source and volume directly from the FUSION-Link certified device. Click HERE to view the current range of certified FUSION-Link MFD's compatible with the MS-IP700i. NMEA 2000 Certified - Connect the MS-IP700i to an existing NMEA 2000 network and communicate with FUSION-Link Certified Multi-Function Displays (MFD) and FUSION's NMEA 2000 Certified wired remote controls (CAB000852 Drop Cable and CAB000581 T-Connector required for NMEA 2000 connectivity - sold separately). Ethernet Ready - Supports FUSION-Link Certified MFD's, iPad, iPhone and Android wired remote control apps via your Ethernet network. Note an All-In-One DHCP Wireless Ethernet router is required for app connectivity. FUSION-Link wireless remote control app for iPad and iPhone is available for FREE for a limited time from iTunes (Click HERE to download the app from iTunes) Android app will be available from June 2013. Innovative 4 Zone Control - Adjust the volume and subwoofer level in four separate zones on-board your vessel. Zones are nameable for added convenience. Have loud music in the cockpit and quieter music in the saloon. For localised zone control, install FUSION's MS-NRX200i Wired Remote Control. Note Zone 3 and 4 require additional amplification, all subwoofer lineouts require amplification. Intuitive and easy to use - Navigation and control of the entertainment experience is simple with FUSION's operating system, designed for simplicity above all else. Most controls are executed via the large rotary encoder and FUSION's iPod interface replicates the controls of the iPod, with FUSION Alpha Search Technology (F.A.S.T) allowing for quick navigation through thousands of songs in seconds. Album art is displayed in colour on screen and FUSION-Link mobile application. Internal iPod / iPhone dock - FUSION's World First Internal iPod dock is continued and upgraded in the MS-IP700i. Introducing an external USB socket for connection of USB flash media and supported smartphone/media players that exceed the internal dock storage constraints. Marine VHF Receiver - Monitor your favourite VHF channels with the FUSION 700 Series. Channel scan, squelch control and 15 user pre-sets are available, so you can listen to your favourite channels such as weather quickly. Video playback - Watch video stored on your iPod or iPhone through the internal dock of the MS-IP700i. Simply connect a compatible television or monitor to the Video Out RCA connection of the stereo and the audio will be played through the stereo speakers. Encased in a fully sealed electrically isolated aluminium chassis, the 700 Series is built to withstand the harsh marine environment. Designed and engineered at FUSION's design headquarters in New Zealand specifically for use in the water. Rated True Marine, the 700 Series has undergone and passed vigorous marine environmental testing and is rated IPx5 water resistant. Note: Additional cabling may be required when connecting the MS-IP700i to a MS-NRX200 wired remote. Please contact Tech support for installation advice.